“God’s fingerprints were all over it,” said Liz Rongen, speaking about how she met her husband, Aaron, when they were both in their mid-30s. “We married later in life, so as we waited on God in our singlehood, we each tried to be faithful and obedient in that time, making choices that would honor God. We both made decisions to be open to God’s plan for our future vocation,” said Liz. Although neither was certain he or she was called to marriage, both took steps to prepare for it. Aaron heard about the group e5 Men, an organization based on Ephesians 5 that encourages men to fast for their wife or future bride if they are not yet married, and he began fasting for his future wife. Liz was the only single woman out of a group of 25 in a Bible study that focused on being a godly wife. Want to go?For more information or to register for the local pilgrimage to the World Meeting of Families, call 1-800-653-0017. To register for the World Meeting of Families, visit http://www.worldmeeting 2015.org. They met at a mission in Jamaica during the summer of 2007. Aaron was serving as a chaperone for a mission trip with a group of youth from northern Minnesota, and Liz, who was living in Florida at the time, was helping the mission camp director. “We ended up working together off and on quite a few times that week on projects and began to develop a friendship,” Liz said. They stayed in touch after returning to the U.S., and their friendship grew through phone calls that always ended in prayer. In the middle of a typical Minnesota winter, Liz visited Aaron and they decided to begin dating. The two were engaged in March 2008, and married later that year. The Rongen’s lost their first child, Mary Clare, during pregnancy; Arthur, 4; John Douglas, 2 and Mary Cate, 9 months, eventually followed. 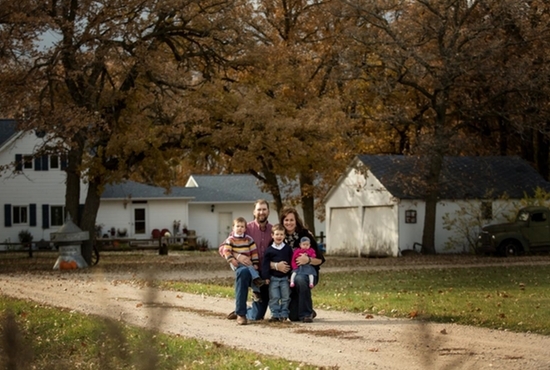 The family lives on the Rongen homestead near Fertile, Minnesota, which has been in Aaron’s family for five generations. Aaron works for Bergeson Nursery and Liz is a stay-at-home mom who, thanks to modern technology, continues working for the restaurant franchise group she worked for in Florida. “We have sacrificed our time and agendas to make our marriage and our kids our biggest priority in the way we invest our time,” Liz said. According to the couple, church, family prayer, date night, family meals and family play time are the cornerstones that help them live their faith. “Our experience of the Catholic Church is one that really fosters a spirit of loving those inside and outside the walls of the church,” Liz said. “This has given us the insight on how we can love by doing our part in these areas. For both of us, this was part of how we ended up in Jamaica to serve the people of that country. The Rongens strive as a family to answer the Lord’s call to love selflessly, despite the obstacles, and live as witnesses of God’s faithfulness to the world through their ordinary, everyday lives. They try to be intentional in their prayer, use of time, financial choices, and everything they do and say. According to Aaron and Liz, the boys’ favorite thing to do for people who need prayers is to sing a song of blessing over them. When they are not able to sing to them in person, they try to do it through video chat or Aaron records them singing their song and sends it in a text to the person. Genereux is a staff writer for Our Northland Diocese, the publication of the Diocese of Crookston.